Are you looking for ways to make your living room a little more modern? It may be fully painted with a perfect set of furniture, but still looks somewhat plain. If you want to make your living room appear contemporary, then consider a few accent pieces to tie it all together. One of the best and most crucial pieces that can be used to make your living room look more modern is a rug. Modern rugs are unique in style and make a great topic of discussion. They add warmth and texture to your home while creating instant elegance. Modern rugs can be bought in a variety of colors and styles. For a modern look, bold colors and abstract prints work well. Pillows can also work. Much like rugs, they come in a variety of colors and patterns and can make your living room look more modern in a matter of seconds. A painting can bring an entire room together by simply matching the color story and theme. If the work of art is abstract or minimalist, then that is even better. One overlooked piece of furniture that can make a difference in creating a modern feel for your living room is a lamp. A lamp in a bold color or with an interesting shade can easily turn any room contemporary. A mirror can make a room look grand and exciting. If you choose a mirror to make your room appear more modern, make sure it is a sleek and industrial design. Of course, it is not a good idea to mix too many statement items together. 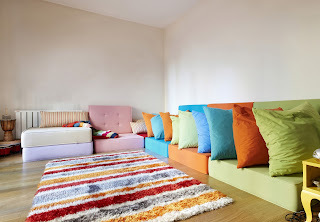 You will want to make one item stand out the most in your home. Too many accent pieces will make your living room look a little overwhelming. However, you can’t go wrong with a modern rug, pillow, painting, lamp, or mirror as an accent.